A new species of African pygmy toad was discovered during an expedition in 2016 to Angola's second highest peak, the Serra da Neve Inselberg. This small toad is distinct among its close relatives in lacking ears, though other more distantly related toads also lack ears. The new species is named Poyntonophrynus pachnodes, with the species name "pachnodes" being Greek for "frosty" in reference to both the name of the mountain ("Mountain of Snow" in Portuguese) and the cool temperatures at the higher elevations where it is found (nearly 1,500 m or 5000 ft above sea level). The new species was discovered and described by an international team of scientists from the Instituto Nacional da Biodiversidade e Áreas de Conservação (Angola), Villanova University (USA), Florida Museum of Natural History (USA), University of Michigan-Dearborn (USA), Museu Nacional de Historia Natural e da Ciência (Portugal), and CIBIO – Centro de Estudos em Biodiversidade e Recursos Genéticos (Portugal), and published in the open access journal ZooKeys. After spending three weeks in the field, the scientists returned from Angola to study the collected amphibians and reptiles through a combination of genetic and anatomical techniques. The team used DNA sequences to determine the relationship of the new earless species to other African toad species. They also used high-resolution computed tomography scanning (CT scanning) to look at the skeletons of these frogs and determine the extent of ear loss. While closely related to other pygmy toads, the new species from Serra da Neve was found to lack both external and internal parts of the ear related to hearing in other frogs and toads. The combination of genetic and anatomical information shows that this new pygmy toad recently evolved from an ancestor that had a completely formed ear. 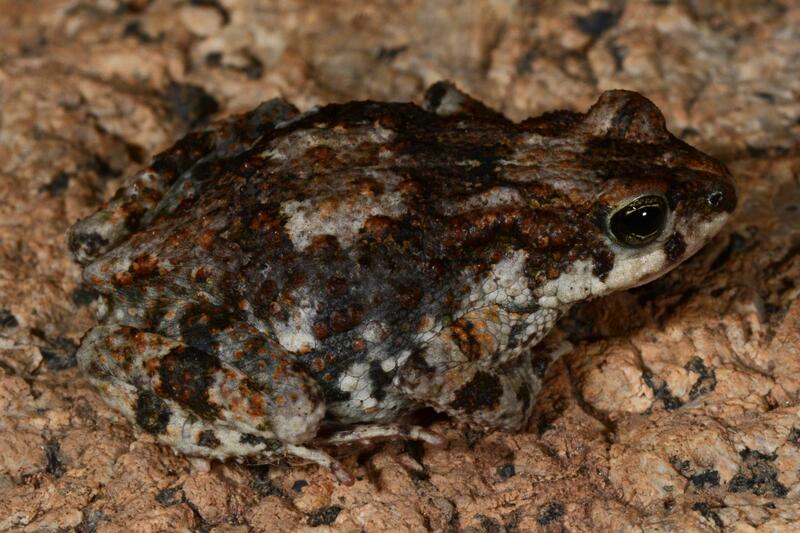 The discovery and description of a new species of toad found only in the mountains of Angola is surprising. Most frogs and toads prefer moist environments such as lowland tropical rainforests or cool montane forests and grasslands. In contrast, most African pygmy toad species can be found in the arid region of southwestern Africa, encompassed by Angola and Namibia. With the addition of this new species, there are now five pygmy toad species present exclusively in this region. Other species are found across other dry regions in southern and eastern Africa. While most groups of African frogs are not rich in species in this region, the affinity for arid environments in African pygmy toads is more similar to groups of lizards, many of which have a number of species present only in this area. Namibe Province is among the better-explored regions of Angola, but little is known of the species found on its isolated mountains, or inselbergs. The Serra da Neve Inselberg is of special interest because of its isolation from other mountains, which allows for the evolution of unique species, such as the new pygmy toad. The recent field research at Serra da Neve and the discovery of this new species of toad contribute to this mountain being considered a priority for conservation in the near future. The new species is small (less than 31 mm in length) and coppery brown in colour. It lives among the rocks and leaves in dry open forests on Serra da Neve. While otherwise similar to other pygmy toads, the lack of ears makes this species distinct among its near relatives. It is unknown whether this species has a mating call and how it might hear. Many other frogs, including many species of toads, have also lost their ears over evolutionary time. The discovery of this new species highlights the Serra da Neve as a potentially important center for Angolan biodiversity, but also suggests that African pygmy toads warrant further attention from scientists interested in the evolutionary loss of ears.